New Delhi, 24th January 2015. Noted academician and recipient of Rashtriya Gaurav Shiksha Puraskar (2014), Dr. Sanjiv Marwah will be taking over as Director of JK Business School (JKBS). Dr. Marwah, who has held this prestigious appointment earlier, will be returning to the JK fraternity after a gap of 5 years, during which he raised the Era Business School as its Founder Director. An industry-veteran-turned-academician, Dr. Marwah is widely regarded for his ability to bridge industry-academia skill gap. His corporate career spanned the 90’s, and was majorly with DCM and Onida. He shifted to academia in the late nineties, and after his PhD has held leadership position in a varied set of institutions; including a University professing 10 professional disciplines. 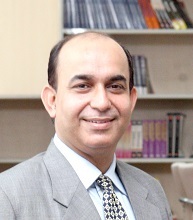 His international associations include Lincolnshire and Humberside University, U.K., Thames Valley University, U.K., University of Bedfordshire, U.K., Singapore Management University, Singapore, Kathmandu School of Management, Nepal, Philadelphia University (USA), Sichuan University, China, and Skyline University, Sharjah. An avid researcher, Dr. Marwah’s work has been published in almost every prestigious journal. He has a book on Project Management (2013) that is widely referred to by Industry and academia. He is currently working on a much-anticipated second book on the subject of Customer Satisfaction. His Student’s Handbook on Research Methodology, for University Postgraduate and M.Phil students, was published in 2009 and found wide acceptance. Earlier he had also brought out a handbook on “Insurance Marketing” in 2005, for the students of AIMA. Dr. Marwah is often published and quoted in a variety of media. Some of these articles are ‘Relationship Effort’ (2004), ‘Head Office is also Responsible’ (2004), ‘Employee-the CRM Initiator’ (2004), ‘Salesmanship in Insurance’ (2004), ‘Internal marketing’ (2003), ‘Relationship Marketing’ (2003), ‘Where is the Customer?’ (2003) and ‘Customer Relationship Management in Insurance’ (2002). Raised in 2006, JKBS is well-known for being a favoured recruiting ground for MNC’s and Indian Conglomerates operation or looking to operate in Gurgaon. JK Business School is known to have been amongst the first B-schools in the Delhi-NCR region to recognise the dual potential of Gurgaon; both as a viable option to Mumbai as the Indian Business Capital, and a challenge to Bangalore as the IT hub of the country. Over the years, some of the largest Corporations, particularly MNC’s, have chosen to headquarter themselves in Gurgaon, making JK Business School’s industry interface amongst the best in http://businesstoday.intoday.in/debatelist/168/1/b-school-debate.htmlthe country. JKBS has been incessantly working towards equipping the future managers and developing business leaders capable of responding to challenges in the emerging markets. JKBS sources a majority of its strong faculty base from IIMs, IITs who have considerable exposure to the industry.